Story of gifted Indian mathematician Srinivasa Ramanujan. Those with an interest in mathematics will likely consider this a wasted opportunity to bring one of their heroes and his work into the public sphere - but casual viewers will find it a harmless time passer, thanks mainly to a charming performance from Irons. In the years since Danny Boyle's Slumdog Millionaire scooped a Best Picture Oscar, we've seen India and its people play their parts in several middlebrow films. The Best Exotic Marigold Hotel and its sequel sent a bunch of British luvvies on a patronising holiday in the subcontinent; Million Dollar Arm told the largely lifeless story of an American baseball agent scouting young Indian cricketers; and The Hundred-Foot Journey mined culture clash comedy in a tale of the rivalry between a French restaurant and its Indian rival. These films are as middle of the road as they come, and while it's somewhat more interesting than those mentioned, The Man Who Knew Infinity slots neatly into a 'Dummies Guide To India' DVD box-set. 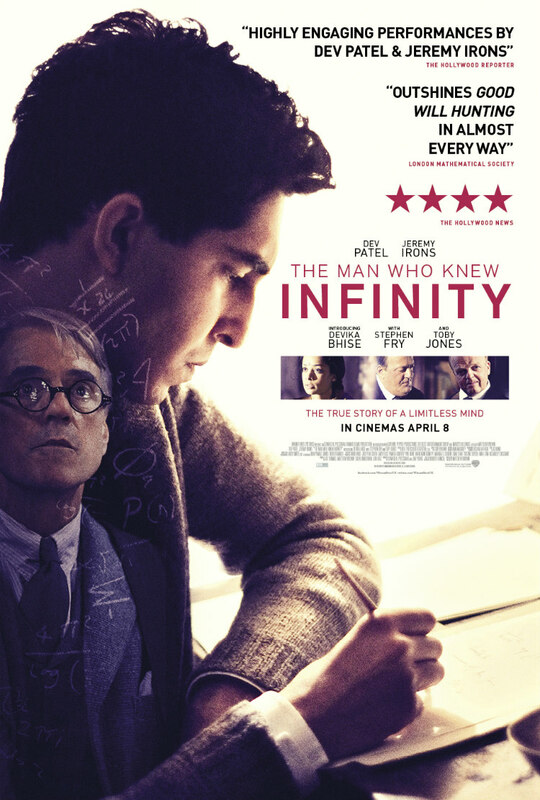 It's the story of Indian mathematician Srinivasa Ramanujan (played, of course, by Dev Patel), who found himself plucked from his Madras accounting job and shipped off to Trinity College, Cambridge in 1914. There he joined up with English mathematician GH Hardy (Jeremy Irons) to develop his work. It's the importance of this 'work' that the film struggles to get across to the audience. While I appreciate the script's reluctance to talk down to the viewer, as someone (like 99% of the general public) unfamiliar with maths beyond the basics of addition and subtraction, I really needed a bone thrown in my direction. Christopher Nolan was widely mocked for a scene in his divisive Interstellar in which a scientist explains black holes in simplistic fashion. "Everyone knows how black holes work! ", was a criticism I read across the internet. Not this writer. To paraphrase Woody Allen, I don't even know how the toaster works! But the truth is, The Man Who Knew Infinity doesn't really care about mathematics. It's more interested in the relationship between its two intellectual giants, and it largely succeeds in this area, despite a dynamic that veers close to a Gene Wilder/Richard Pryor comedy - "He's an atheist! He's a Hindu! Can they solve mathematics' greatest puzzle?" Key to its success is its refusal to make either Hardy or Ramanujan likeable. They may possess great minds, but you wouldn't invite either man over for dinner. Ramanujan is arrogant and ungrateful for the opportunity Hardy has presented him, and he doesn't seem to care much for the impossibly beautiful wife he left behind in India (radiant newcomer Dhevika Bhise). Hardy meanwhile makes little effort to befriend his young charge; he seems only interested in what's inside Ramanujan's head. The atheist/Hindu dynamic appears crude at first, but ultimately it's sensitively handled. There's a particularly effective scene in which Ramanujan tells Hardy he gets his gift for numbers directly from his God, and asks the older man if he believes him. Hardy admirably sticks to his guns, telling Ramujan he simply can't believe in such things. Any atheist will be all too familiar with how such moments can make you feel like a cold-hearted villain. Like most biopics of talented figures, The Man Who Knew Infinity fails to pay sufficient tribute to its subject's legacy - those with an interest in mathematics will likely consider this a wasted opportunity to bring one of their heroes and his work into the public sphere - but casual viewers will find it a harmless time passer, thanks mainly to a charming performance from Irons.